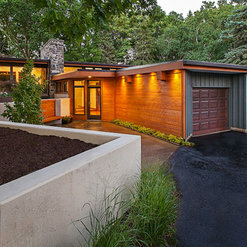 Ann Arbor Award-Winning Architecture Firm- 4X Best of Houzz Winner! 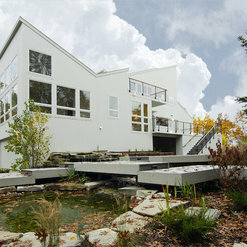 Detroit Home Awards in categories including: Renovation under 1000 sq. 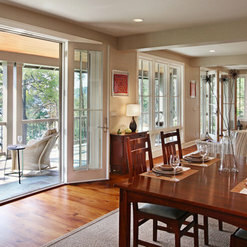 ft., Historic Residential Renovation, Vacation Home, Kitchen Design, Custom Window Installation, and Use of Interior Color. One of the biggest issues in our house was how dark it was in some of the rooms. Now that the work is done, I walk around in the morning to turn off lights before leaving, to save the electricity, but then I realize there aren't any lights on. The new windows really solved that problem in a really thoughtful way. The Angelinis really listened to our wants, carefully evaluated our needs, kept our budget uppermost in mind, delivered an imaginative and creative proposal, and monitored progress throughout the construction. We couldn't be happier with their work. Architects don't cost money; they save money. 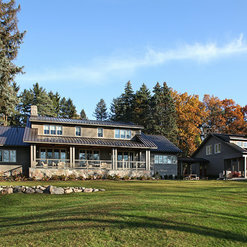 Brad and Theresa brought an excellent perspective to the update of our modern Michigan house. They were able to help us preserve much of the original character while accommodating for 21st century layouts and conveniences. They were easy to work with, timely, and provided us with several digital mock-ups to help us envision the final product. 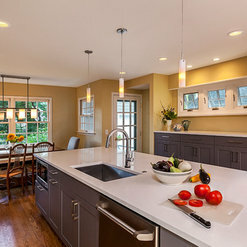 We used Angelini and Associates to remodel our kitchen and they came up with a wonderful idea that gave us a redesigned kitchen/dining room and laundry room. This was done in 2010. Then in 2013 we again used them to design a master bedroom/bathroom/garage/greenhouse addition. We are VERY pleased with them and their company! 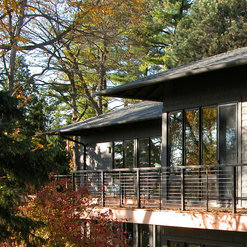 We're delighted with the multi-story addition Angelini Architects designed for our 90+-year old house! 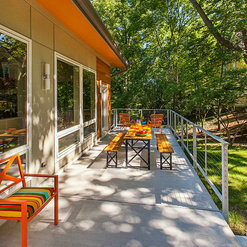 It was a complicated project -- homeowners who hadn't renovated before, structural issues, a super-narrow lot and a desire to keep the tiny backyard from disappearing completely -- but Brad and Theresa handled it with aplomb. The addition has all the charm of the original and flows so effortlessly into the old house that most folks can't tell it was an add-on. The end result even solves problems we didn't know we had. And the expert advice and support we got in choosing items like kitchen cabinets, brick, doors and windows saved us time and prevented costly mistakes. Many thanks, Brad and Theresa! 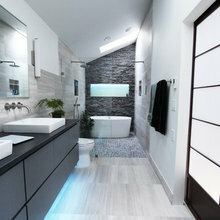 We worked with Angelini & Associates Architects three times: twice for home improvement projects (kitchen and bath) and once for a plan for a new office space for my employer. 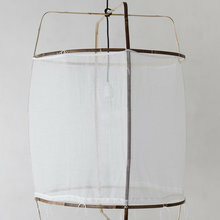 Each time they brought creative thinking, problem solving, and a beautiful elegance to the work. 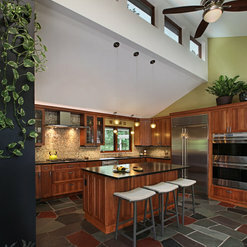 We love love love the kitchen they designed for us in 2009. They insisted on larger windows than we'd first planned and eliminated a structural issue with an inspired design update. 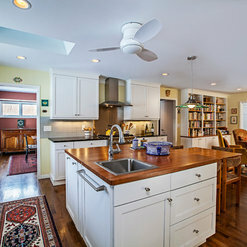 The kitchen has a wonderful flow for entertaining, it's beautiful, and it is where we spend much of our time together. 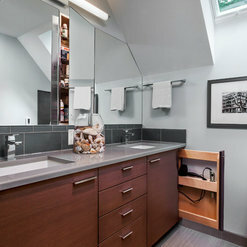 In 2007, their bathroom design updated a tight space to provide additional storage and greater functionality. They increased the usable floor space by replacing the swing-in door with a pocket door. Magic! The Angelini's truly listened to us and improved on our ideas well beyond our imagination. We worked as a team and that spirit continued throughout the entire life cycle of the project. What was most impressive was their strategic approach to the project. Their team is well organized and met deadlines. The blueprint level was able to be directly translated into calculating accurate construction costs. Construction can be frustrating, but the Angelinis actually made it rewarding. I can't imagine working with a better firm. My husband and I originally worked with Brad and Theresa Angelini in 1991 when we bought our home. We did a whole house renovation. In addition to detailed architectural drawings they provided three dimensional models showing what the home would look like after the renovation. It was an absolute delight to work with them and a major plus to work with a husband and wife team. Over the years we have worked with them several more times on various projects including expansion of a room through an exterior wall, redoing the deck, roof, and siding, adding additional windows to the home, etc. Each time they have been wonderful to work with. Brad and Theresa are very thoughtful, creative, responsive, practical, genial, and professional. We highly recommend them. Commented: What wood for window trim and front door? Thx!We used vertical grain fir. 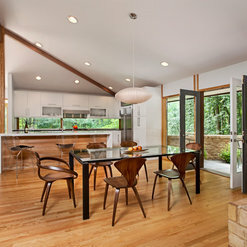 This was a common trim material for mid-century modern architects. It is now more difficult to find and the grain is not as fine as in the 50's and 60's. Commented: fireplace materialThank you for the kind comment. The material on the fireplace is a black slate tile. Commented: Would you please share the paint color on the walls? Thank you!Thank you for your comment on the space. We are very happy with the way that it came out. The paint color of the walls is Benjamin Moore White Dove OC-17. Commented: Wall colorThank you for the question. The white of the walls is Sherwin Williams Pure White - SW-7005. Commented: amazing A2 View!Much appreciated, Thank You!